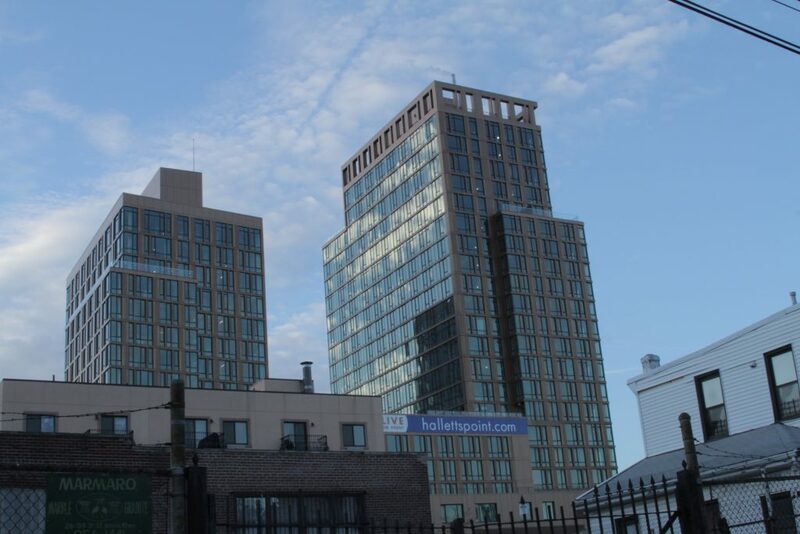 During our visit, the area around 10 Hallets Point did not have the hallmarks of a 2,000+ apartment unit megaproject that gained so much attention in 2014. It was quiet, little in the way of traffic, with construction debris strewn around. 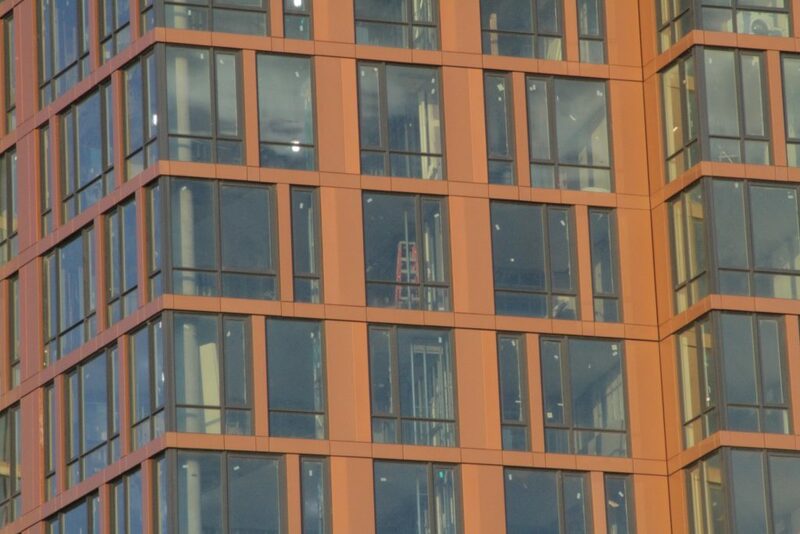 But 10 Hallets Point did look like it was close to completion, with most exterior work complete. The interior is another story. From our vantage, the interior windows were still covered with dust, work ladders were still in position, and drywall and painting work was not yet compete. That ladder is probably not part of the amenities package. 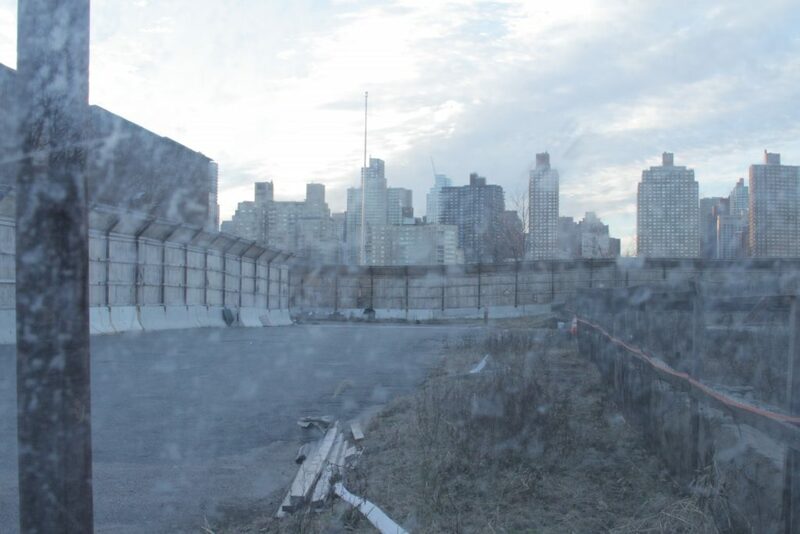 The best hint we found that Hallets Point will see additional development, and may live up to expectations for megaproject status, was a demolition project across the street. Along the East River, across from 10 Hallets, is another property under development from the Durst Organization. This project, located on block 916, lot 1, will be 31 stories tall and contain 358 apartments according to DOB records. We’re still looking for documentation that conveys affordability with this project, if it exists. Next door at block 916, lot 10, will be residential project 26 stories tall and 276 units according to the DOB. A search on DOF property tax records, DOF property tax benefits search, and ACRIS found no evidence of affordability for these two anticipated projects. This doesn’t mean all hope is lost for affordability though. We noticed at the time of our visit there’s no physical work going on at the premises, just remnants of asphalt and concrete from the prior structures. It’s not unusual for regulatory agreements or 421-a certifications to appear well after construction has started. Back to DOB records, we saw construction management firm Urban Atelier Group LLC recently refiled, and was approved by DOB, for excavation permits on January 2, 2019. A nearly identical permit was filed and approved for lot 1 on January 3, 2019. So while I think it can be said the Durst Organization hasn’t given up on the project, there’s no breakneck quest to turn this dusty street into the glimmering megaproject anytime soon, and certainly not by 2020. All quiet along the East River. You won’t find this in the promotional posters for the development site. It will be quite some time before Hallets Point is redeveloped. It’s a strange juxtaposition of luxury housing in a neighborhood catering to mostly NYCHA projects and supportive housing. I suppose one can argue that a good percentage of Hallets Point and eventually, Astoria Cove, will have a relatively large population of rent stabilized units with rents that cater to a lower income community. 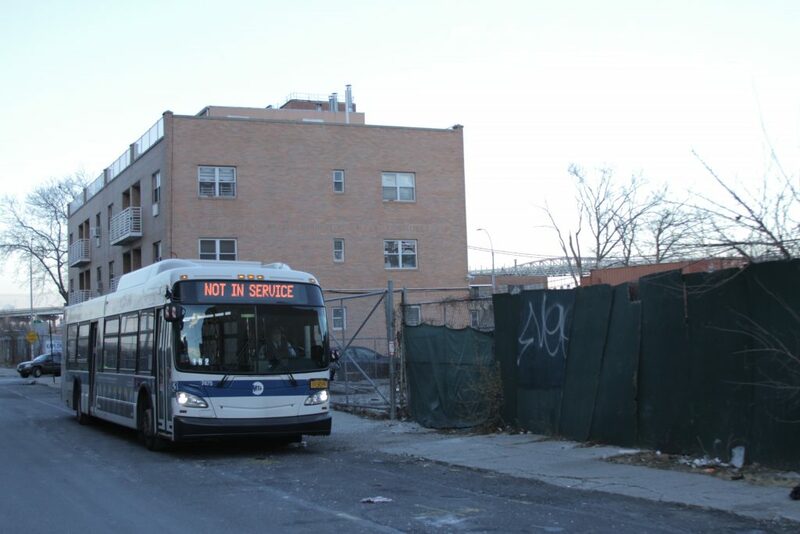 But it will also have a large influx of wealthy residents that’ll want to bring wealthy people things into the community, leaving an uncertain future ahead for this part of Astoria. 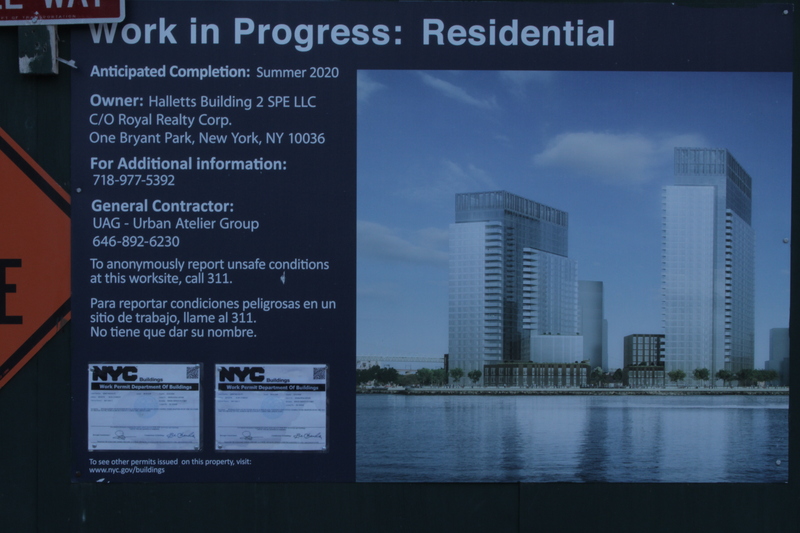 But what is certain, and they don’t have this on the promotional posters for 10 Hallets Point, is that if you want to use the water taxi, you’ll have to walk through NYCHA’s Astoria Houses, or take a long walk around them. NYC Map on the left, Hallets Point’s map on the right.